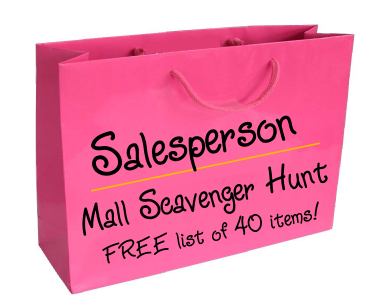 In this different type of Mall Scavenger Hunt teams must ask salespeople in the mall for items on their list. The items listed below (over 40 of them!) are things that salespeople should be able to give the teams free of charge. The Salespeople must sign the checklist or send a business card to verify that it was given to the team. No two items can be acquired at the same store. Free for non-commercial use - if posting on the web please use a link back - birthday party ideas. Thank you! 5 points for each item teams bring back. No two items may be from the same store. Salespersons initials required on all items.